Pattern Power / Superstripe is the first in a series of annual events exploring the powerful presence of pattern and it’s ability to positively inspire and connect us all. 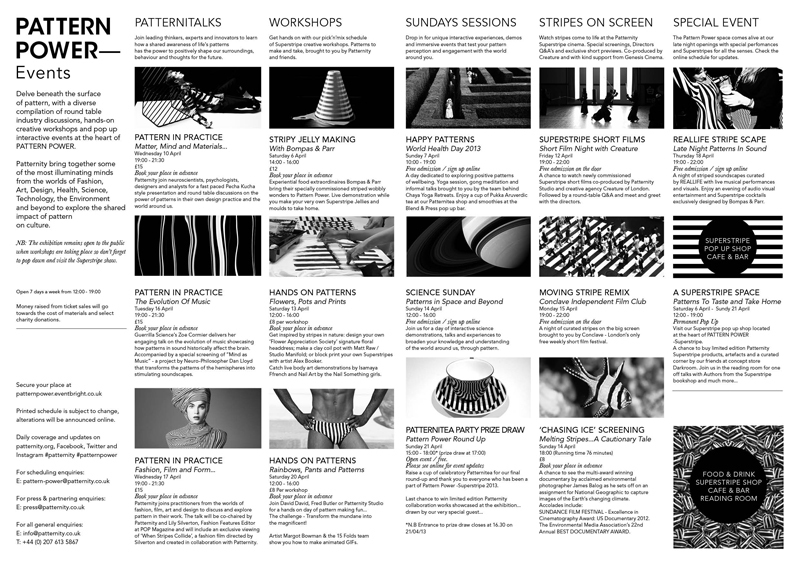 Visitors will be immersed in an intriguing and tactile world of stripes as Patternity transport their iconic curation and ethos of ‘celebrating pattern everywhere’ boldly into the real world. Look up, down and around the 3000sqft gallery space and uncover a rich and inspiring archive of one of life’s most striking and engaging patterns. Participants may bring things they have woven for feedback on how to wet finish. 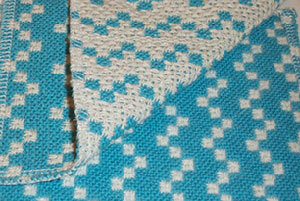 Laura Fry is a well known international tutor and professional hand weaver from Canada. Read more on her blog. Fee: £50.00. Numbers limited. To book a place, please call 01330 844409, or use the contact form. 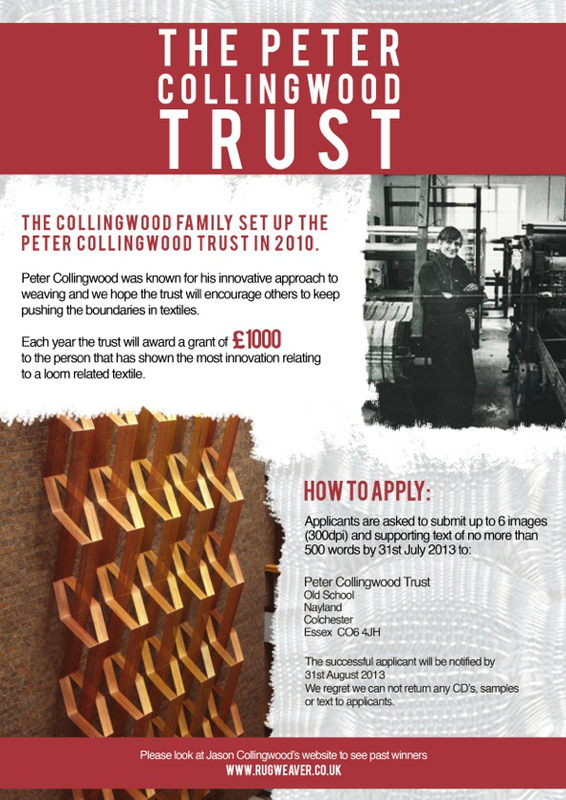 The workshops are suitable for those with experience of handweaving and using Photoshop. Participants should bring their own laptop with Adobe Photoshop or Photoshop Elements installed. 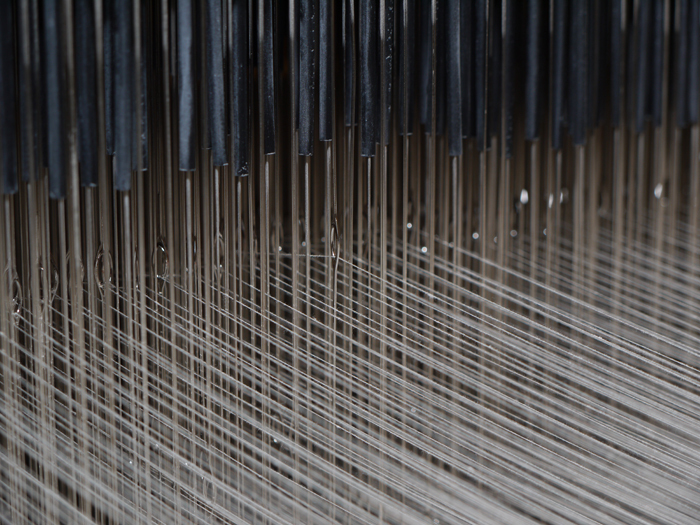 Two day workshops provide an introduction to designing weave structures digitally in Adobe Photoshop or Photoshop Elements specifically for weaving on a digital jacquard looms including the TC-1 & -TC-2 loom. 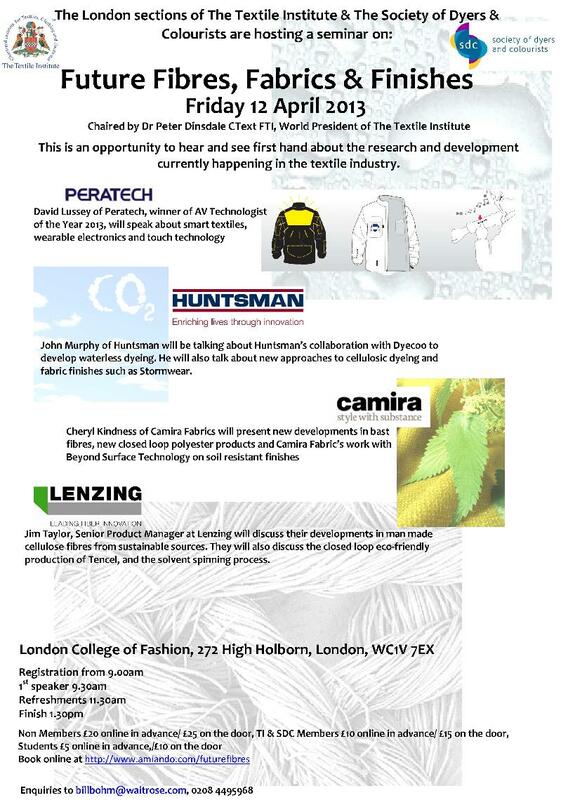 The workshop will explain the TC-1 loom control programme. Participants will get experience of working with the TC-1 loom in the studio and have the chance to complete a design and a small test weave. Three day workshops extend to designing more complex weave structures, such as lampas and specific weaves as requested. One to one tuition is also available. Please contact Belinda Rose (details below) to discuss. Tuesday 9th to Thursday 11th July 2013, 10.00am–5.00pm each day. This workshop requires a minimum number of 3 participants to run. The workshop costs £250 (including £100 non-refundable deposit). The cost of warp yarns are included, students will supply weft yarns for their samples. The course is non residential. We can supply a list of local accommodation. To discuss the course, and payment please call Belinda Rose on +44 (0)1330 844409, or use the contact form. Launching this week, a new label Yolke. 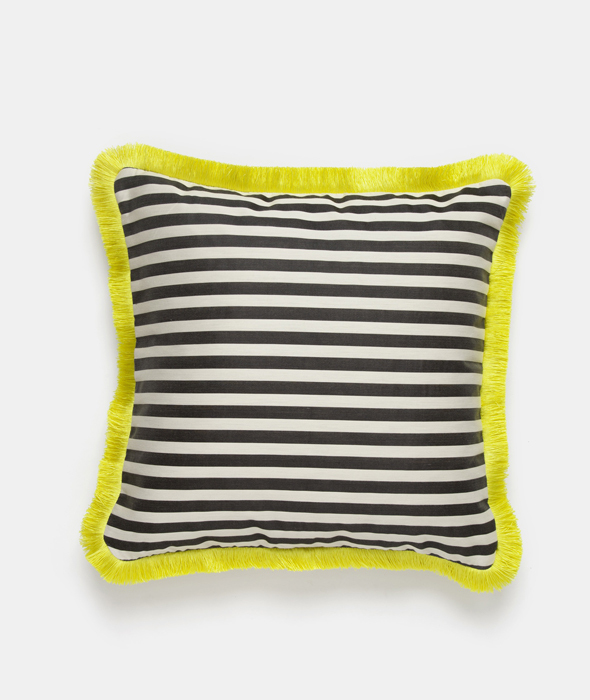 Yolke is the brainchild of weave designer Heloise Ringner and interior designer Anna Williamson. 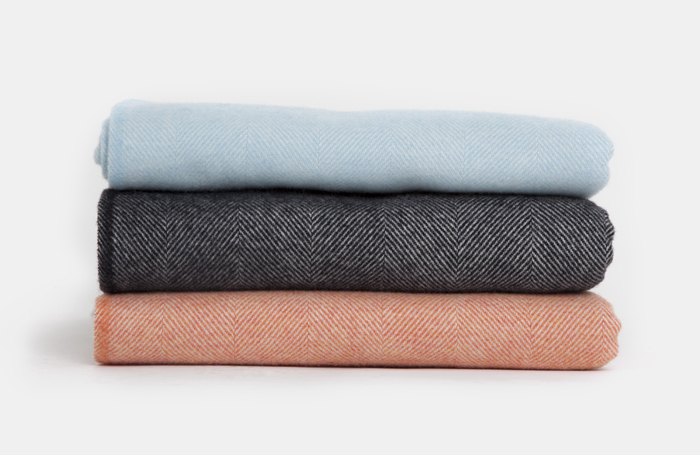 The label ensures all the woven products are make in the UK and they aim to ‘make life a little more beautiful’ with silk cushions, and super soft lambswool blankets all in unique Yolke prints and soft neon shades. 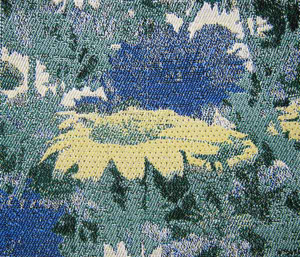 The products focus on the quality and craftsmanship of UK homegrown textile industries. Yolke also have fashion items on sale. The cushion fabrics have been woven at Vanners, Sudbury Suffolk and the blankets at the Cotswold Woollen Weavers. Yolke sourced the commission weavers and yarn suppliers from The Weave Shed website. She realises how pressurised your time is, but hopes that the information gleaned from this survey will help secure funding for a much-needed weave facility which could directly benefit your business in the future. Laura is working to an extremely tight timescale to submit this feasibility study and so would be extremely appreciative to receive your valuable answers, by this coming Saturday, 16th March. Please do forward this link on to anyone you think might be interested and keen to offer their thoughts. ‘Weave’ is a one day conference will bring together a diverse group of experts to explore weaving and woven structures. The day will discuss how weaving has progressed and developed while continuing to delight in traditional textiles skills. These are inspirational designer makers who test the boundaries of textile material and experiment with how far those boundaries can be pushed. The work they produce is exciting, beautiful, intelligent and inspiring. The day will bring opportunities for makers and designers to contribute their specialist skills and knowledge of materials and encourage new systems and processes. The day will explore and discuss new techniques while basking in the pleasure of woven cloth.